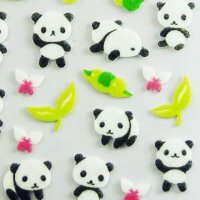 Baby Pandas Felt Decoration Sticker Sheet , Stickers, Stationery, Craft supplies - Starscastle Online Shop: Gift bags, Wallets, Accessories, and more! For all panda lovers this sticker sheet is for you! Make your scrapbooks and craft projects stand out.